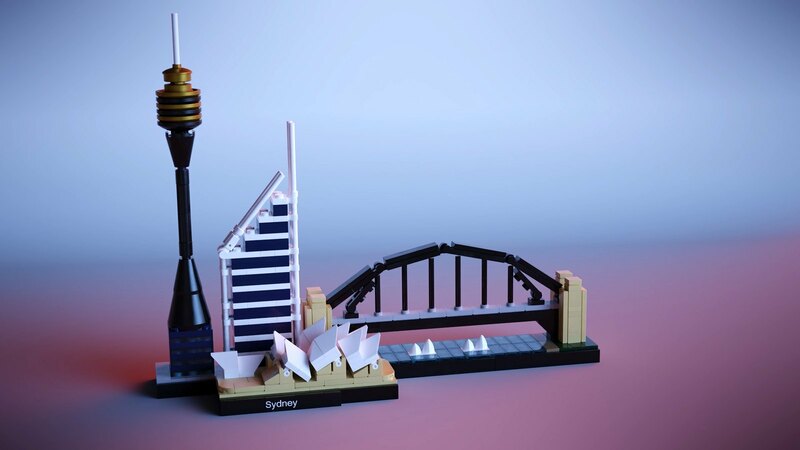 Although a repeat LEGO render, 21032 Sydney has been updated for 2019. To my dismay, I�d forgotten my own workflow. After fumbling around a bit, I was able to export my model in the correct format. To my surprise, Safari works now�it adds a little file icon in the address bar for the download. Once I got past the easy part, my struggle only got worse. I opened up my original Sydney render, which threw me for a loop. Apparently I saved it when the render was a separate window. I was completely lost for a bit until I figured out I could close it. Whew. I thought I might be able to import the model into this Blender file, but no luck. It was for an older version and things didn�t quite work. It was to my advantage, though. I needed to fumble around in Blender again to remember how things worked. And fumble I did. It took me more than a few minutes to find the settings I wanted before starting over. As fortune would have it, I still had my render history in Blender. I was able to find my last template file and get things started. Back drop and HDR updated? Check. Model imported? Check again. Camera moved and rotated? Well, after a few minutes of key guessing�check. A few more minor tweaks and I was ready to render! Although I didn�t grab the old camera positions, the final render was close enough. It didn�t take too long either. You can tell it is a different template when compared to the original. This version isn�t quite as shiny, but it looks quite pleasing and realistic. The perspective is better as well, showing more of the model. So, 2019 is starting off well. Let�s see if I keep this up throughout the year.